Australian chain of department stores David Jones has launched its Christmas ad, showcasing the variety of festive foods available to purchase for this holiday. 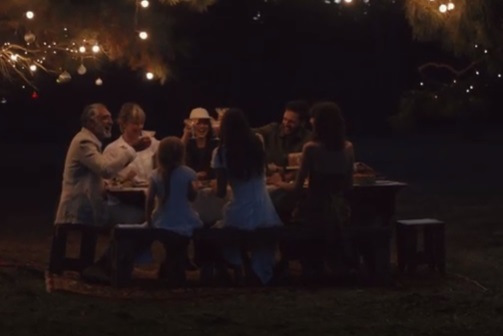 The 15-second spot features a family outdoor, around the Christmas table, which is filled with lots of dishes, from a roasted turkey to vegetables, to cheese, to dessert. They are seen passing over the food, sharing stories, laughing out loud and clinking their glasses an entire afternoon, until the night comes. The song playing in the background is the 2014 single “Dear Santa” by Norwegian dance-pop singer/songwriter Monica Birkenes, professionally known as Mr Little Jeans. David Jones’ range of festive food also includes fruit cakes, panettone wrapped boxes, various types of pudding, pudding logs, panforte cakes, various types of biscuits, shortbread sticks, shortbread, spices teas, wines, and more. The retailer, which offers thousands of products online from numerous brands across fashion, footwear, beauty, home, electrical, designer and more, has put together a gift guide, helping visitors to find the perfect something for their dear ones, from small tokens to big-ticket items. A range of luxury gifts, show-stopping dresses hand-picked by Alice McCall, Carla Zampati and more, tableware, toys, books, and many other items are available to browse and purchase at prices that suit every budget. Moreover, this Christmas, David Jones has partnered with the Australian Literacy and Numeracy Foundation (ALNF) and Disney, choosing ten beautiful books that can be purchased as special gifts for vulnerable children across the nation. For every book you generously purchase to donate, Disney will match your donation with an additional book.